Here, we have two shots of Goseiger‘s GoseiKnight, definitely wouldn’t want to be on the receiving end of that attack. Am I mistaken, or his blade in that attack the wrong color? And here we have ShinkenGold with his finishing move. Note the Shinkenger-style decorations in the background. So far, there’s been no confirmation on whether or not Go-KaiSilver will also be in the game. Of course, with all these other past Sixth Rangers included in the game, why wouldn’t he be? And no, there won’t be a Sixth Ranger from Goranger included, for very obvious reasons. Super Sentai Battle: Ranger Cross will be released on September 8th (wait, that’s tomorrow! And it’s already the 8th in Japan!) for 5800 yen, for the Nintendo Wii. Power Rangers Miracle Force OP and ED: Korean is a fun language! They’re pretty good renditions of the original Japanese theme songs by NoB and Takahashi Hideyuki (both from Project.R). Interestingly enough, both theme songs were performed in Korean by Sang-geol Lee. Not sure who that is, but I’m very interested in finding out. Anyway, what do you guys think of the new Korean versions? Author M.F. CalhounPosted on August 30, 2011 August 30, 2011 Categories MC's postsTags ending theme, Korean Dub, new, NoB, opening theme, Power Rangers Miracle Force, Project.R, Sang-geol Lee, South Korea, Takahashi Hideyuki, Tensou Sentai GoseigerLeave a comment on Power Rangers Miracle Force OP and ED: Korean is a fun language! 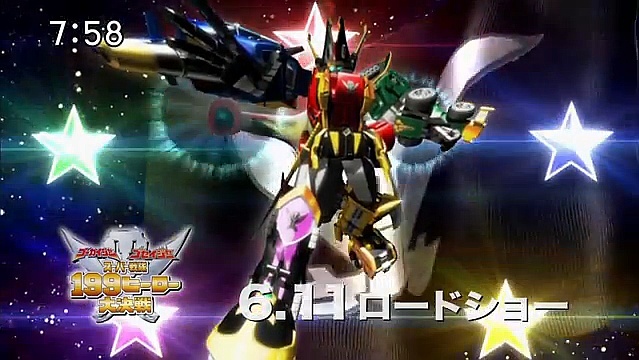 Super Sentai Battle:Ranger Cross First TV Spot! Don’t you just feel as excited as the kids in that commercial!!! (Okay, maybe not that excited, but still). In the game, the Go-Kaigers go up against the villain Devil Jark, whose sole mission is to prevent our heroes from obtaining the Greatest Treasure in the Universe. You play as the five teams mentioned before (Go-Kaiger, Goseiger, Shinkenger, Go-Onger, and Goranger), and fight a villain each round both on foot and in a giant robot fight! The game will be available September 8th for the Wii, and includes a DX Go-KaiRed RangerKey. Author M.F. CalhounPosted on August 25, 2011 August 25, 2011 Categories MC's postsTags announcement, gameplay, Go-Onger, Goranger, Kaizoku Sentai Go-kaiger, Nintendo Wii, preview, Samurai Sentai Shinkenger, Super Sentai Battle: Ranger Cross, Tensou Sentai Goseiger, trailer, tv spot, video gameLeave a comment on Super Sentai Battle:Ranger Cross First TV Spot! Power Rangers Casting Sides Released: Goseiger it is! Two weeks ago, we learned from an inside source that Saban would be having casting calls sometime this month for the next batch of Power Rangers for the 2012 season. A week later, we found out that they had cancelled the bigger casting call event, with no reason given. Well, now we’ve learned that they are going to hold auditions for the 2012 Power Rangers season! • Please correspond by email if you need to re-schedule your audition time. 22nd is Monday through Thursday from 10-noon and 1:00-5:00 PM. • Please bring 2 headshots and resumes. just above her right hip. Slowly, she sits on the floor and leans against the wall. AVA comes looking for her. SADIE, SADIE, are you okay? You’re injured. Let me see. I told you. Don’t worry. Just go back. I’ll meet you inside. I won’t leave you like this. I think you need to rest a while. SADIE looks into the room and sees a group of girls playing with dolls and toys. I always wanted to play like that. SADIE turns to AVA. She smiles but is sad. talking this way. I don’t quite feel like myself. wife, maybe even a normal mother one day. I am sure you will be all of those things. Sadie brushes it off with a smile. No. It’s fine. I understand. held back by the shooting pain in her side. Very deep stuff. 😛 Anyway, like it said in the thing, auditions will be held next Monday, the 22nd, until Thursday the 25th, from 10:00-Noon and 1:00-5:00 pm. You’ll need to email them to set up an audition time. If you’d like to download any of the other sides, just click the Showfax.com link above. For anyone out there bold enough to try out, I say good luck to you! Break a leg, just not your own! Author M.F. CalhounPosted on August 19, 2011 August 19, 2011 Categories MC's postsTags 2012, adaption, announcement, casting call, official, Power Rangers, Saban Brands, sides, Tensou Sentai Goseiger21 Comments on Power Rangers Casting Sides Released: Goseiger it is! For anyone who doesn’t know, there has been an ongoing dub project for Sentai series in South Korea since Abaranger premiered there under the title “Power Rangers Dino Thunder” (the original Disney-produced American Dino Thunder never aired there). Almost every series following Abaranger has been dubbed over and aired in Korean, with the only exception being Shinkenger (due mostly to cultural differences, and their grudge against Japan, at least to some extent). Power Rangers Miracle Force will air July 2011. And just so that we’re clear, THIS IS A KOREAN DUB OF THE ORIGINAL SENTAI SERIES, THIS IS NOT SABAN GETTING AHEAD OF ITSELF. IF SABAN DECIDES TO MAKE GOSEIGER INTO A RANGER SERIES, I’LL BE SURE TO LET YOU KNOW. This is just for those of you who might see this article and think this is an announcement for the next Saban’s Power Rangers Series. Go-Kaiger Goseiger Super Sentai 199 Update: Nearly there! If you’d rather not have the movie ruined by spoilers, then stop reading here. But if you don’t live in Japan, then I would suggest that you just go ahead and read on, because we all know it’ll be months before we get to see it. In one scene the change into Dynaman and use Dynaman’s “Big Explosion” to finish off a troop of Gorims that were behind them. Reedeming themselves for getting their butts handed to them using Dynaman’s power, I see. Go-KaiSilver was also in the movie, but he didn’t have a real speaking role, like when Accel showed up in the Decade/W Movie Taissen 2010. No word on if Gai Ikari shows up in some cheesy fashion at the end of the movie like Ryu did, though. They don’t get a Great Power from the Goseigers, so that probably means that there will be a separate Goseiger tribute episode. And Navi is the one who brings back GoseiKnight. At the end, the Goseigers return the RangerKeys to the pirates. I have a feeling that there going to find some big flashy way to give all the past Sentais their powers back at the end of the series. During the robo figh scene, there WASN’T some big gattai with all of the past robos, but they did use all of their finishing moves together. In some cases, they had to use old footage for some of the attacks from the older series robos. They just can’t quite fight like they use to, I guess. At one point, Zangyack corners GoseiGreat, and Akaranger and Big One fly in to save them. Shiba Kaoru, along with some of the other extra heroes, have appeared with them. The Extra Heroes end up getting chased down by the Gormins, when Rio, Mele, and Wolzard Fire show up to help. That’s all that’s been said of the movie, I’m sure there will be more about as we get closer to 11th. If anything else pops up about this or anything else, I’ll be sure to let you know. Author M.F. CalhounPosted on June 1, 2011 June 1, 2011 Categories MC's postsTags Go-Kaiger Goseiger Super Sentai 199 Hero Great War, Go-KaiSilver, Kaizoku Sentai Go-kaiger, Super Sentai, Tensou Sentai Goseiger, ToeiLeave a comment on Go-Kaiger Goseiger Super Sentai 199 Update: Nearly there!